Here are some of the frequently asked questions that we hear, and a short response. If you have any other questions, please don't hesitate to contact us! What makes your summer camp unique, and why should we choose you? Great question! There are three things that makes Shaffer's High Sierra Camp unique and deserving your trust for this summer. First is our small size. With just 88 or fewer campers, you won't get lost in a crowd. Our intimate size lets you get to know just about everyone, and hopefully make friends that will last a life time. Second is our location. Nestled in California's splendid Tahoe National Forest on the peaceful headwaters of the North Yuba River and adjacent to the Sierra Buttes and the Lakes Basin Recreation Area, you are not only surrounded by incomparable beauty, but 70+ pristine mountain lakes, miles and miles of hiking and biking trails, and tons things to do. You won't get bored! And third is our focus on child and youth development using noncompetitive wilderness adventure activities that are designed to promote essential life skills such as self-confidence, self-esteem, independence, social competence, and judgment. We're located about 45 minutes north of Truckee (toward Quincy, as opposed to east toward Reno). Our street address is 38782 Highway 49, Sattley, CA 96124. You can view and download our map and directions. DO NOT USE an online mapping service, which have inaccurately placed the camp miles from its actual location. What is your ratio of staff to campers? It averages about 1 staff member per 5 or 6 campers, but varies according to activity. For some activities such as backpacking, mountain biking, and rock climbing, the ratio may be 1 staff member per 4 or 5 campers. For other activities such as Arts and Crafts, the ratio may be 1 staff member per 10 or 12 campers. In cabins, there is one staff member for each 5 campers. In tipis, there is one staff member for each 6 campers. These ratios are for on-duty staff members, and do not include administrators, kitchen staff or facilities personnel. We do not take all employees of the Camp and divide by the number of campers to come up with an unrealistically low ratio. How big are your cabins and tipis? We have two cedar cabins, which are divided into two rooms. Each room houses 1 staff member and up to 5 campers. Typically, the oldest campers are assigned to the cedar cabins. We also have "Miner's Tents", which are walled tents on wood platforms. They sleep 1 counselor and up to 7 campers in bunk beds. We also have a few tipis, typically for our youngest campers. The tipis are quite large, 18' to 21' in diameter, and sleep up to 6 campers and 1 staff member. The tipis are pitched on a wooden platform to raise them off the ground and campers sleep on 5 inch thick mattresses. I see that kids stay in both cabins and tipis. How do you figure out who stays where? Generally, we try to assign younger campers to the tipis, the oldest campers to the cedar cabins but most sleep in the Miner's Tents. However, because campers are grouped by age as well as gender, if we have a large group of younger (9 to 11) or middle-aged (12-13) campers it sometimes makes more sense for us to switch the bunk assignments around. Do you have "real" toilets and showers? Campers use real flush toilets, not pit or portable toilets. There are also private showers with hot and cold running water. How do you select staff? We are fortunate to be able to draw from a very large pool of applicants to select the ideal staff. Each year, we have a great number of applications for each open counselor/activity specialist position. We look for people who show maturity, judgment, leadership abilities, and enthusiasm. All staff are personally interviewed by the Camp director(s), have their references checked, and undergo a background check. Read more about our staff and staff selection. Do campers get to choose the activities in which they participate? Yes! The first day, all campers go through a group problem solving activity on the low ropes challenge course as a structured way of meeting and getting to know the other campers. Campers also undergo a swim test so that we can assess their swimming abilities. Other than those activities, campers have a list of activities from which to choose each day. If they they have a favorite, they can return time and time again. Horseback trail riding and whitewater rafting are handled a little differently. Because we use professional outfitters, horseback riders and rafters reconfirm their desire to go riding or rafting two days before a trip. To see a description and sample menu, click here. Campers predominately come from the West Coast and California in particular, though we have had campers from the East Coast, Mid West, and South, in addition to overseas, including China, England, France, Germany, Spain, Hungary, Guatemala, Honduras, Mexico, Romania, Turkey, Angola, Japan, Indonesia, Malaysia, and Taiwan. What's the ratio of boys to girls/girls to boys? The ratio is roughly 50%/50%. We have had some sessions as much as 60% boys and 40% girls, and other sessions up to 60% girls and 40% boys. Our health center is staffed with a nurse or doctor, who assists campers with administering their medications and providing basic first aid. We also have access to a Downieville health clinic and the Tahoe Forest Hospital in Truckee. 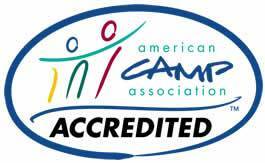 Yes, we're accredited by the American Camp Association (ACA). Click here to read more about accreditation. My child has occasional problems with bedwetting. How do you handle that? My child is on medication. How do you handle that? All medications, prescription and nonprescription, are checked in with the nurse and kept locked in the health center. There is an exception for certain medications such as inhalers and bee sting kits which must be kept with a camper for immediate application in a medical emergency. The nurse then assists in administering medications in accordance with instructions from a physician or parent, as appropriate. If your child is on Ritalin or similar medication, we require that he/she continues with the medication. Children receive skill and safety instruction in numerous activities where having their full attention is critical to their safety. Camp is not the time or place for your child to take a break from his or her medication. The nurse counts the doses of medications to ensure there is a sufficient amount for your child's planned stay. Some level of homesickness is common. Fortunately, severe homesickness is relatively rare. The first step we take is to train our staff to recognize homesickness. Our staff will talk to your camper to gauge how he or she is feeling and the degree of homesickness. We'll focus your child on the many fun activities yet to do at camp and keep him or her busy. Fortunately, most homesickness passes in a couple of days. There are a few things parents can do to help their children have a positive experience. First, we discourage calls to or from home. Children tend to experience separation anxiety all over again after calling home, actually making their homesickness worse. You can also help prepare your camper by avoiding telling him/her that you'll come and pick them up if they get homesick. Though the sentiment is nice, the reality is that this tends to undermine a camper's commitment to staying the course. Also, having a first-time camper spend the night at a friend's house before going away to camp can be beneficial. The ACA has some very good articles on homesickness and helping to prepare your child for camp. To read their article on homesickness, click here. My child did not use all of his/her camp store credit / did not go on a prepaid optional activity. Do we get a refund, and if so, when? Yes. You will get a refund of any unused camp store credit or prepaid rafting (assuming we were notified before we reconfirmed the reservation with the rafting company). Refunds are made by September 15, when we close our books for the summer.